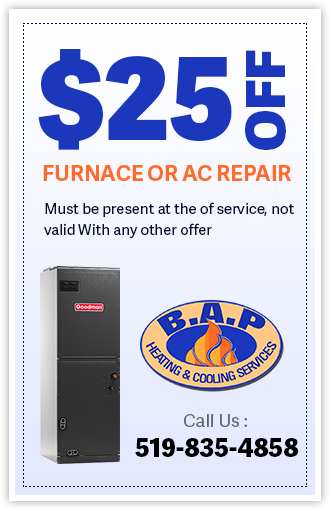 If you live in the Kitchener-Waterloo-Cambridge area or surrounding, BAP Heating Service is an important member of your home maintenance list, including Heating and Cooling Services in Guelph, ON. A proactive approach is usually a less expensive strategy than being reactive; in other words, regular maintenance will help your HVAC system last longer, and you will only require small Heating and Cooling Services in Guelph, ON in your furnace’s lifetime. We offer professional Heating and Cooling Services in Guelph, ON with a monthly maintenance plan. For a nominal monthly fee, our licensed technician will inspect your furnace on a regular basis. During these routine inspections, they can identify potential issues and problems as they arise and repair them right away. Identifying issues early will protect your HVAC system from further damage and more expensive future repairs. B.A.P. Heating & Cooling Services will take care of furnace replacements as well. Once a full replacement becomes necessary (and that day will come!) 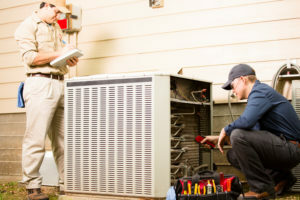 a qualified technician will take care of replacing your old furnace with a new, more energy efficient model. Generally, furnaces that are older than 15 years are considered for replacement. This is because there are always more technologically advanced models coming on the market, as well as more energy efficient models. It may seem like a large expense, but over the long term, a new, energy efficient furnace can save you thousands of dollars in heating and cooling costs. Call today and find out how you can save money on your next furnace. 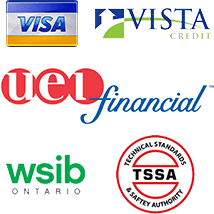 If you are in Southern Ontario, you know you will need HVAC services such as Heating and Cooling Services in Guelph, ON. 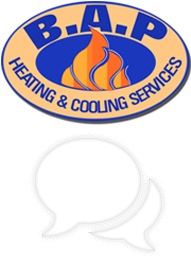 Contact us today for Heating and Cooling Services in Guelph, ON and surrounding areas!